Our proactive approach to thermal fluid management is considerably more favourable to disposal and replacement of thermal fluid, both financially and environmentally. We’re experts in understanding and mangaging the natural degradation that occurs in all heat transfer fluid. Our proactive maintenance plan will extend the life of your thermal fluid when we apply a range of interventions. ISO 14001 certification is an independent assessment of an organisation’s environmental management system and demonstrates our due care to and minimisation of environmental risks and hazards, and our compliance with relevant legislation. 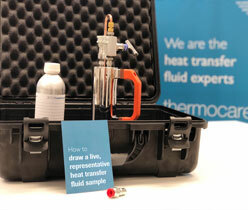 Our thermal fluid engineers travel the length and breadth of the UK testing and monitoring heat transfer systems. To maximise each journey and minimise our carbon footprint we always attempt to schedule multiple visits when driving to a specific region. Our storage and distribution capability ensures we deliver on-time every time in the most efficient way possible. Our clients manage their complete account history online, with sample reports, recommendations and technical data sheets available to view and download at the click of a button. Accessing information is quick and convenient and reduces our reliance on a paper based reporting system. Our on-going communications programme keeps our customers up to date on product news, legal matters and special offers through regular e-bulletins.